Here’s a recipe for feeling isolated: Move across the country, have a new baby, and then have your husband leave for a long deployment, all within a few months time span. Last July, my Army doctor husband and I moved from Texas to Virginia with a toddler and a seven-months-pregnant belly. Less than eight weeks later, my second son was born. And nine weeks after that, my husband left for a many-months deployment to Afghanistan. I was alone with two young kids in a place that had just barely become our new home. For me, staying busy—sometimes really, insanely busy—is my coping method for just about everything. But being in a new place can be a recipe for disaster when it comes to staying busy with an infant and a toddler. It can take months (or, dare I say, years?) to make friends and discover the lay of the land in a new community. I was seriously worried I would become a hermit when my husband left (or at least, a hermit with two kids who has to occasionally leave the house for Target essentials). But here’s where I lucked out. At our last duty station in San Antonio, I had the incredible fortune to discover Fit4Mom and Stroller Strides. For nearly three years, my life revolved around Monday, Wednesday and Friday workouts with an amazing group of moms. We commiserated over kids that wouldn’t sleep, watched in amazement as our babies grew, and pushed our bodies to be stronger. I didn’t think every Fit4Mom community could possibly be as amazing and supportive but figured I had nothing to lose by checking out my new local Fit4Mom when we arrived in Virginia (like, literally, a few days after we arrived, when we were living out of a hotel). So I showed up to this new Stroller Strides group, seven months pregnant with a borrowed jogging stroller and a little (or maybe a lot) skeptical of how different they might be from my last Fit4Mom group. And here’s the wonderful thing: They were different in all sorts of ways from the San Antonio Fit4Mom friends I’d said tearful goodbyes to, but still this fantastic welcoming community. So four months later, when my husband was halfway around the world and I was stuck here with a 9 week old and a 3 year old, I wasn’t nearly as alone as I might have been otherwise. 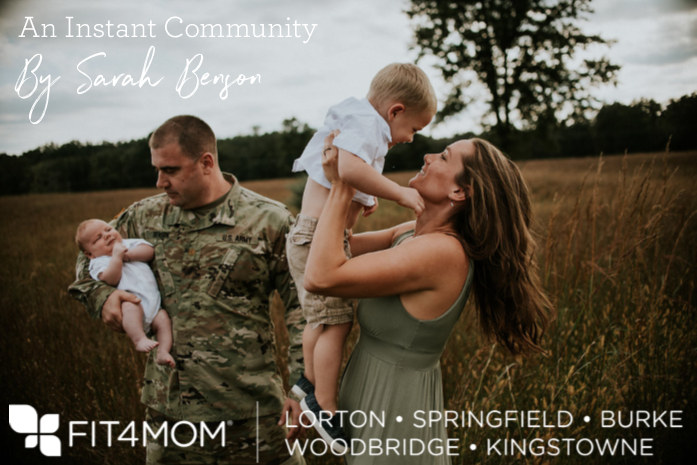 In fact, with the high number of military families in Northern Virginia, there are even other moms in the Fit4Mom community with deployed spouses, recently-deployed spouses, or soon-to-be deployed spouses. In the first weeks of my husband’s deployment, I not only had three or four Stroller Strides classes a week, but also this steady stream of social events keeping me busy— Fit4Mom playdates, birthday parties of Fit4Mom kids, a Fit4Mom “mompreneur” event, and gymnastic classes with Fit4Mom friends. I also had people I barely knew, or had only known for a few weeks or months, sending me messages asking whether I needed anything. There’s no denying that going through a deployment with young kids is tough, and I’m still in the thick of it, counting down the days until it’s over and I have a helping hand at bedtime again. Maybe the rest of my survival techniques will be another blog post, when I’ve come out the other side. But for now, I’m so thankful that—within weeks of moving to Virginia— this Fit4Mom community became part of my deployment survival recipe.